Now I ask 'ya, what good upstanding American home back in '49 would be without a brown swirled Bakelite Silvertone radio? Not many as I recall. 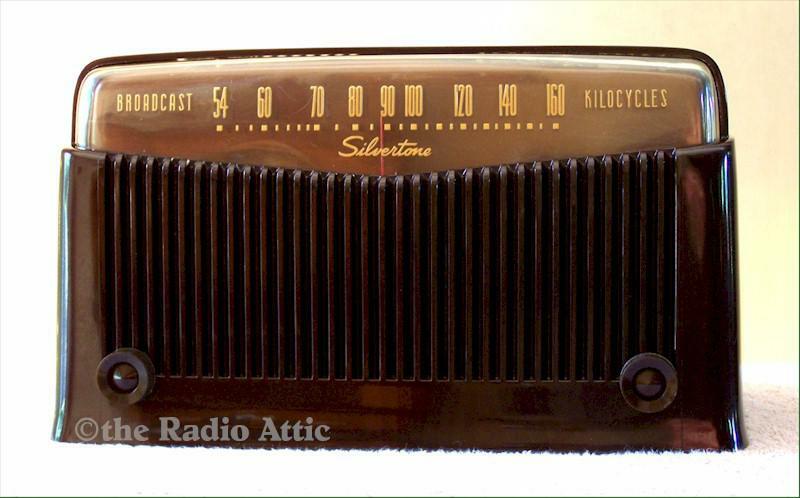 These radios were dependable, reliable and kinda handsome! This beauty is no exception! There is, however, a minor blemish (small hairline) on the left side near the the top. Absolutely does not distract from its character. It has been electronically reconditioned and aligned with new paper and electrolytic capacitors and out of tolerance resistors were replaced. The five tubes are strong and it has a new power cord. There's an external antenna connection for greater station sensitivity, too. A Jim Dennis Scale of Beauty "American as Apple Pie Special!" If you'd like additional pictures please let me know. 11-1/2"W x 6-3/4"H x 6-1/2"D.
You are visitor number 2,173 to this page.